QC Event School graduate and tutor Athena DeVonne owns and runs her own thriving business, Coalesce Creations Wedding & Events, and knows everything there is to know about becoming a successful event planner! Last month, she took to Facebook to give advice about starting an event planning business and answered many aspiring planners’ questions. If you missed out, don’t worry! We’re going to recap some of her viewers’ best questions about getting your event planning business off the ground! Is it difficult to start a website with a small portfolio? 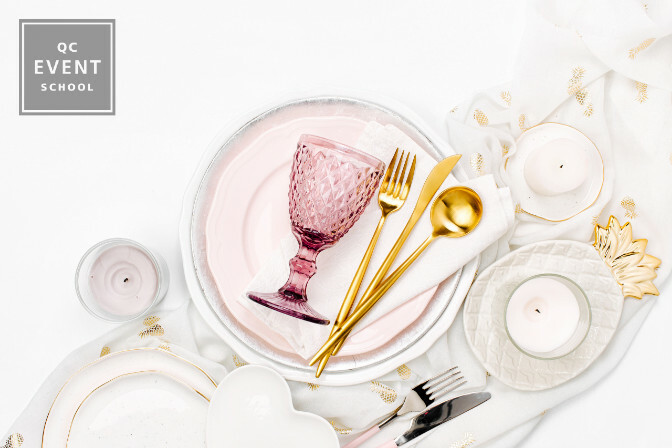 This is how styled shoots come into play! Styled shoots don’t have to be an absolute big production. Yes, those types of shoots are effective and beneficial for all involved. BUT they are also time consuming to plan and execute when you need to coordinate with a number of vendors. Invest in a great camera. Athena recommends a nice Canon or Nikon camera. In the past, she’s taken behind-the-scenes photos at her weddings and is able to promote her business with them as she waits for the professional photos to arrive. Invest in a linen. Purchase a good quality linen. They’re reusable when you attend bridal shows or conventions, so you’ll need a good one anyway! Decorate a mock wedding dinner table outside. Natural lighting is best for professional photos. Take multiple shots from different angles of the same table. Take a photo of just the floral arrangement, another of just the plates and cutlery, and another of the fancy name cards. They could all occupy the same table, but emphasizing different aspects shows off your range and attention to detail! Doing one of these shoots will give you enough promotional social media posts for 30 days! You may also decide to use stock photos, but other businesses in your area could be doing the same thing. The last thing you want is to have clients see the same photo duplicated on other sites. It’s best to do it yourself as it will be a reflection of your actual talent! Another option you have is to ask friends or family who have recently gotten married. You can work with them to do a styled shoot as well. Close up shots of someone buttoning up a dress or fastening a boutonniere are wonderful additions to your online portfolio! While taking courses, how would you start working on promoting your business at an affordable price? Athena refers to the wise advice of her mother. If you run a business as a business, you get business results. But if you run a business as a hobby, you get hobby results. Finding event jobs as a newbie in the business can be tough, but she still wouldn’t recommend doing a free event for someone. You don’t want to discount your services! However, a free event that benefits your business without you losing money is worth putting on. Athena’s best advice? Put together a launch party when you first start your business! For her launch party, Athena planned and executed every aspect of an event that she would have done for a client, for herself. Everything from booking the venue to creating centerpieces to hiring live entertainment, she coordinated everything she thought people wanted to see in their events at her event. Vendors: She invited vendors she wanted to one day work with so they could see what she could do. Friends of Friends: She invited families and friends and asked them to bring people who were getting married soon. Acquaintances: She contacted engaged couples on social media and invited them to her party, telling them that they could meet a variety of wedding vendors in one place. She made it worthwhile for everyone to attend the event. Her party became a networking event for attendees and also allowed everyone to experience an event she personally planned. Of the six potential brides to show up to her launch party, and she ended up booking three of them. When you take a chance and invite people to an event you worked hard on, you can get great results even without prior experience. A launch party allows you to promote your business without sacrificing income. She cautions that free or heavily discounted services could negatively impact your business prospects down the line. People will expect your events to be free or heavily discounted if you set a precedent. Instead, she recommends doing special offers and promotions of value. She connected with a photographer early in her career and they became familiar with each other’s services. The photographer loved her work so much, she told Athena that her next six bridal clients who booked her photography services too, would receive a free engagement photo session. That’s a $250-$500 value! Athena didn’t lose any money and was still compensated for her services. She was able to offer these discounts because she built a great vendor relationship. She now has several vendors who offer discounts for referring her booked clients to them as well. What is the type of attorney you need to hire to look over your contracts? There’s no one type. Creative attorneys are the best for your creative needs and services. You do need a tax attorney, but you can contact any attorney when it comes to client and vendor contracts. Just outline the legal services you’re looking for when you speak with them. They’ll be able to let you know if they offer the exact services you need. Otherwise, they’ll refer you to someone who does. Was your question not answered here? Check out the Facebook webinar to hear the rest of her answers. And check back on our blog in a few weeks to read part two! Ready to get your career started? 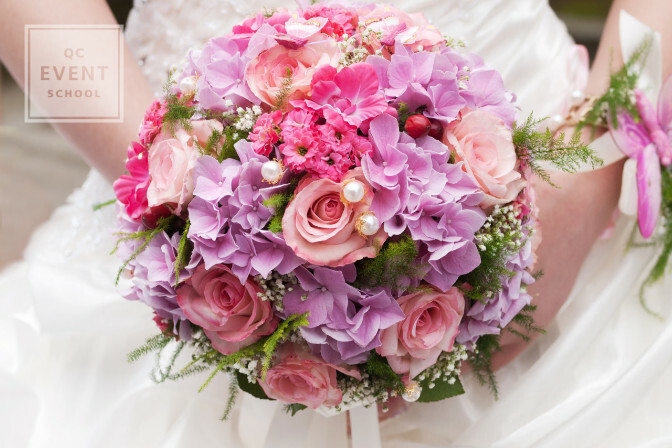 Take the Event & Wedding Planning course! Well…maybe some social media recognition too? It is crucial to gain some awareness online when you start the business.